As a leading provider of wireless services, installation & management for large venues since 2002, we know Guest WiFi. We create a "Roaming WIFI" for your shoppers. Lure them into stores with special offers and coupons broadcast directly to their mobile devices! Our innovative new approach to Guest WiFi keeps each store in control of their own Branding, SMS & Email Marketing, while benefiting from data collection from one central WiFi login. With one simple login, via Facebook, Phone # or Email, customers can walk up and down the street and maintain a consistent wireless connection. Seamless Wireless - Inside & Out! Our Main Street wireless service manages seamless wireless connections for large venues cohesively through a series of secure networks. Our service provides the flexibility to offer Customized Marketing Services and unique WiFi Engagement for each business, while the customer never even notices they're switching networks. Capture on site customers by sending personalized SMS & push notifications to people that walk by with Proximity Marketing. 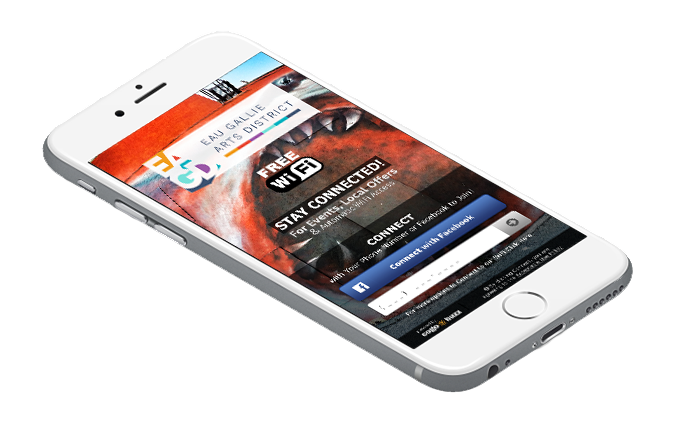 And bring customers back with SMS campaigns using the info collected from your WiFi! Each business can also design their own splash pages to promote their events, deals, and more. Further engagement with customers both on site and off site! Our management portal lets you view information from every CoGoBox in your network with one simple login. It’s fast, efficient and the easiest way to increase the number of customers for the downtown area. For a custom network plan for your area, contact us today!